Goof Troop SNES Super Nintendo Game Cartridge Cleaned Tested and Guaranteed to Work! 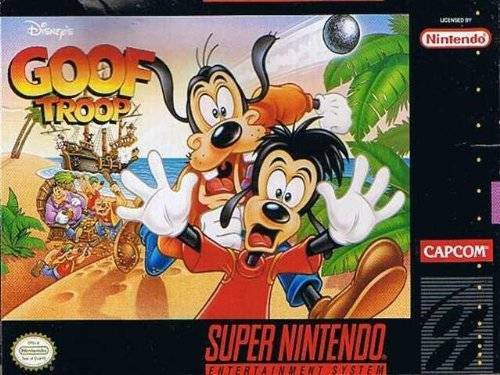 Set sail for adventure with the Goof Troop! It's a great day for fishing and Goofy just caught a boatload of trouble! 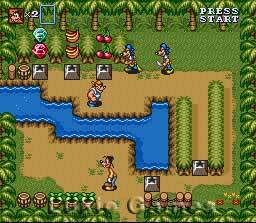 Pete and PJ have been kidnapped by pirates and Goofy and Max must row to their rescue. It's hilarious hijinks on the high seas as they trail the pirates to Spoonerville Island and bumble through the jungle to free their pals from the notorious Keelhaul Pete! Great game for two players. Bought his game to play because I heard it had good multiplayer. It does it's a great game! My 4 year old daughter really enjoys it too good game for young kids. Very great and underrated game. Great mix of puzzles and action. Capcon did great with another Disney title. After hearing how fun this game is and finding it on this website i decided to give it a shot. The game arrived quickly, worked wonderfully (like all titles I've purchased from lukie games so far) and was some of the most fun I've had with a co-operative game in a long time. 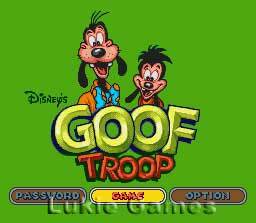 Goof Troop is like an older four swords and is very fun i highly reccomend it. This game is not fast paced like mega man or earthworm jim, but it is a strategy game. it's a ton of fun with 2 players. This game is great. It is much better if you have someone to play with. The co-op in this game is a lot of fun. It's what you would expect of a Disney game made by capcom of this generation. Each zone has it's own distinct theme to it. 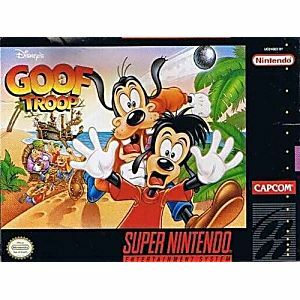 If you ever played a link to the past (if you haven't you should) a lot of the puzzles in goof troop will remind you of it. This a classic game ! I played a lot when was I children ! And I'll play more! Is funny , cool and is little difficult to play ! Have puzzle boring !